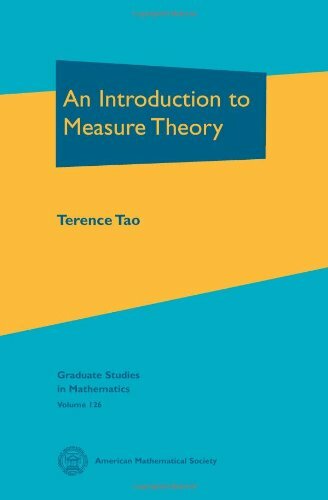 [PDF] An Introduction to Measure Theory (Graduate Studies in Mathematics) | Free eBooks Download - EBOOKEE! Description: This is a graduate text introducing the fundamentals of measure theory and integration theory, which is the foundation of modern real analysis. The text focuses first on the concrete setting of Lebesgue measure and the Lebesgue integral (which in turn is motivated by the more classical concepts of Jordan measure and the Riemann integral), before moving on to abstract measure and integration theory, including the standard convergence theorems, Fubini's theorem, and the Caratheodory extension theorem. Classical differentiation theorems, such as the Lebesgue and Rademacher differentiation theorems, are also covered, as are connections with probability theory. No comments for "[PDF] An Introduction to Measure Theory (Graduate Studies in Mathematics)".